Earn $2.56 in Rewards credit. Click to learn more. When it's you against the clock, or you against the entire pack of riders trying to quash your bid for victory, the Vittoria Corsa Speed Clincher will keep egging you on so you cross the finish line first. It harnesses every performance advantage of its G+ Isotech® graphene rubber compound and strips away anything that doesn't help it be lighter, faster, and more aerodynamic. 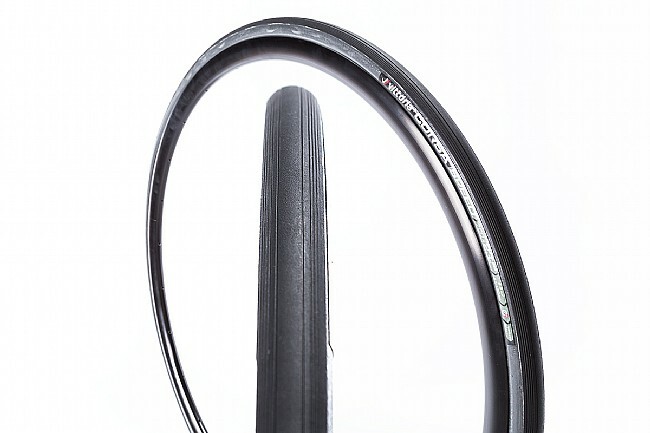 A supple open-tubular design is backed with a Tubeless Corespun casing making it one of the top performing tubeless race clinchers around. 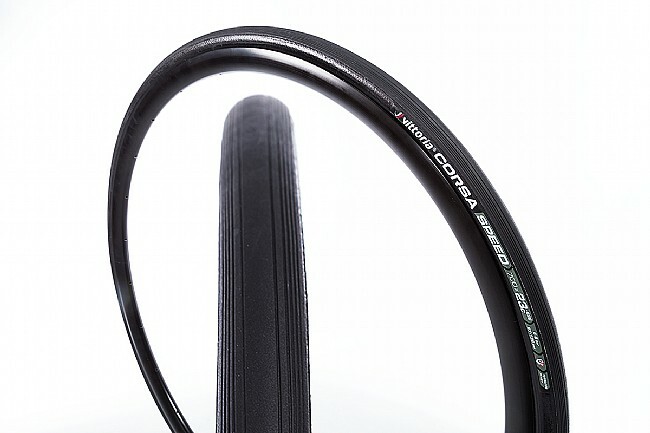 Thanks to the addition of graphene to the Corsa Speed's rubber compound, this tire handles well in both the wet and dry with minimal rolling resistance yet impressive puncture resistance for a competition tire this light. 700 x 23 mm. Claimed weight is 225 g. 320 TPI casing. Tubeless ready. Have tried my diff tires. Was a diehard on Michelin Pro4 Service Course andContinental AttackForce III Clincher. 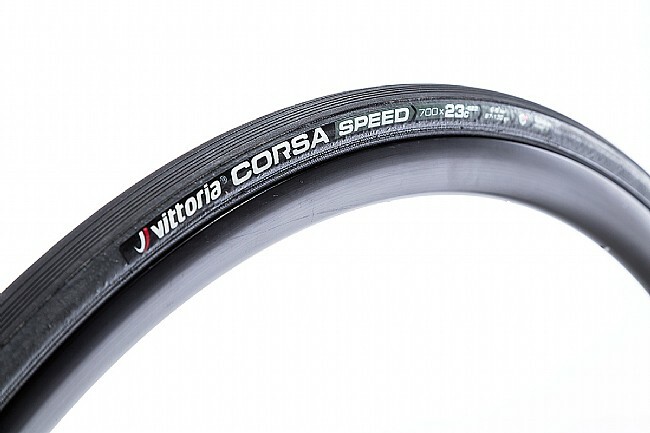 But with these Vitoria Coras Spoed G with latex tubes just cant bet the feel. I rides these year around and get only 1-2 flats. I wouldnt trade these tires for any other in my opinion. Used for triathlons, no problems mounting, smooth ride, and relatively puncture resistant with the exception of large holes. These tires have worked well for me and I haven't punctured on them yet, so 5 stars. Road bike use tubeless at 90psi and 192lb rider. 2017 Cannondale Supersix EVO HM. These tires accelerate faster than any clincher I've run, tubeless or tubed (Schwalbe, Conti), but cut easily. I've flatted and patched both front and rear inside 250 miles. The sidewalls are particularly thin, so watch out for pavement boundaries that scuff them. But the speed they deliver is addictive. Use them for race. I switched to vittoria from continental when my mechanic noticed too little clearance between the tire and my F8 frame. He told me the profile for this 25mm tire was lower than the 25mm conti. He was right! I have gotten a few pebbles from the road stuck between the tire and frame due to the minimal clearance. Additionally, these are very comfortable and smooth - I ride at 110 lbs pressure. I have had no issues changing flats on my ZIPP 303 carbon wheels with these tires. I doubt they will last as long as the conti, but so far so good! Though it was a bit of a struggle to get these mounted, once on they are amazing. Fast and smooth, only downside is i dont feel they have quite the same grip in the corners. Set up tubeless, took a couple of days with orange seal to properly. The carcus is very porous. Also rides a little rough for a 25mm tire. Even at only 80-85 psi(I weigh 185)Feels very fragile. Measures a little under 27mm on a 19mm internal width rim. So the good- is the fastest and the lightest tire I have ridden. If you have a t t bike this is the tire for you. Not sure an improvement but these are really good. Pricey but that's new tech for ya. These ride as good as Corsa Evo's and I have confidence in cornering. I notice they feel thin, but that's probably in my mind. I can't comment on longevity but so far so good, no visible cuts yet. Mounting is easy and the fact it's only a 23 is good with me, I prefer them anyway.